A Tire Pressure Monitoring System (TPMS) is generally an electronic system intended to monitor the air pressure inside all the pneumatic tires on automobiles, Aero plane undercarriages, straddle-lift carriers, forklifts and other vehicles. The system is also sometimes called as a Tire Pressure Indication System (TPIS). Such type of devices tell real time tire pressure information to the driver of the vehicle - either via a gauge, a display, or a simple low pressure warning light. Furthermore, the plan will urge the implementation of safety. You can also Subscribe to FINAL YEAR PROJECT'S by Email for more such projects and seminar. The block diagram shown above consists of 3 main parts viz. Sensor unit, Micro-controller unit and Battery. The pressure sensor resistor is varying depends upon the alcohol contents of the air. This will be mostly linear to the alcohol. During the normal condition the resistance of sensor shoots up to Meg ohm ranges. In normal condition, the Resistance of the Sensor is high. The voltages applied to the non-inverting terminal (+ ive) is low when compared to the inverting terminal voltages (- ive). In that time, the OP-AMP output is –Vsat. (I.e -12 Volt). There is no signal given to the microcontroller unit. In low pressure condition, the Resistance of the sensor is low due to intensity of the light or fire. The voltages applied to the non-inverting terminal (+ ive) is high when compared to the inverting terminal voltages (- ive). In that time, the OP-AMP output is +Vsat. (I.e +12 Volt). The transistor and in “ON” condition and this signal is given to the microcontroller unit. The pressure sensor feel the pressure contents of the tubes of the air. This sensing signal is given to the microcontroller unit. When there are in required pressure level, there is no signal given to the microcontroller unit. In this project, 12 volt battery power supply is used. 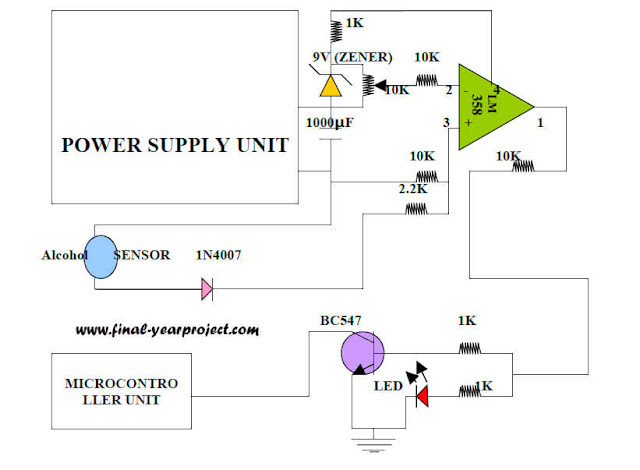 The power supply output is given to the control unit. Control unit having three relays, they are connected to the alarm unit. Initially the reference voltage is set with the help of the variable resistance. The air pressure contents is sensed by the sensor and this control signal is given to the microcontroller unit. Use this mechanical engineering project for your reference and study work. This project report also contains micro-controller programming.